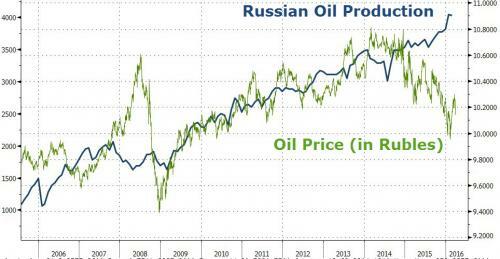 First it was the Saudis; then Russia announced another month of record oil production. And now it is Iraq's turn. According to the state-run Oil Marketing Co., Iraq increased crude output to a record level in March, ahead of the long-awaited April 17 meeting in Qatar where OPEC members and other producers may or may not (they won't) agree to cap production to curb a global glut. As Bloomberg reports, crude output in OPEC’s second-biggest producer rose to 4.55 million barrels a day last month from 4.46 million barrels in February, while exports increased to 3.81 million barrels a day in March from 3.23 million the previous month, the company, known as Somo, said in an e-mailed statement. The 500,000 barrel increase in monthly barrels has made up almost entirely for the 600,000 barrel decline in US shale output. Ahead of the Doha meeting, Iraq - which is clearly pumping at full power - supports an agreement reached in February between Saudi Arabia, Russia, Venezuela and Qatar to cap output at January levels. Well maybe: this is what the Iraqi Oil Ministry Spokesman Asim Jihad said on March 23, without confirming if the country agrees to freeze its own production. Iraq's unprecedented oil production has been duly documented here. 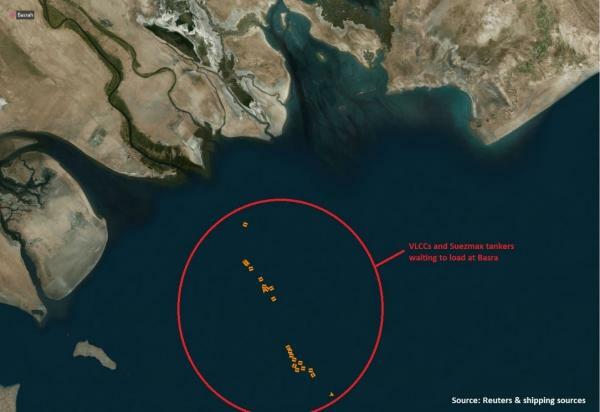 Recall just on Friday we showed a line of oil tankers caught in a traffic jam near the Iraqi port of Basra, causing delays in loading. The culprit is high oil production in Iraq. The port at Basra is struggling to load up all the oil tankers fast enough, forcing some to sit and wait. Iraq exported about 3.26 million barrels per day (mb/d) in March from its southern coast, which is up from just 2.5 mb/d in 2010. Furthermore, we already know that Iran and Libya have refused to cap output putting any Doha agreement in jeopardy because as the Saudis made all too clear two weeks ago, they won't limit their own production without Iran joining, but for now the market has hope. Just like Iran, Iraq is boosting output and exports after decades of economic sanctions and war. The country pumped a then-record 4.43 million barrels a day in January, the International Energy Agency said in a report published last month. Iraq holds the world’s fifth-biggest crude oil reserves. Iran on the other hand, has said it won't limit production until it reaches the roughly 4+ million barrell output it had before US sanctions crippled its production. As Bloomberg reminds us, Iraq’s Oil Minister Adel Abdul Mahdi suspended his participation in the cabinet last month, citing disarray in government ministries. Nizar Saleem Numan, who was nominated to replace him, withdrew his candidacy earlier this month, citing a lack of agreement over the make-up of the proposed cabinet. In short: any attempts to rein in Iraq's oil production will face an uphill climb. As for Iran, the WSJ warns that the the upshot from the country's slow return to peak output is that it may have given false comfort to the rebounding oil market. "Some analysts think that the amount of Iranian crude stored on supertankers has even increased. Betting that those barrels won't show up at a refinery soon or that Iran will willingly cut short its return to the oil market would be naive." For Kuwait and the U.A.E., the goals are even higher. Kuwait plans to raise production capacity by 5 percent from 3 million barrels a day by the third quarter, and to reach 4 million barrels by 2020. Abu Dhabi means to lift production capacity to 3.5 million barrels a day by 2017 from about 3 million.For Saudi Arabia the expansion is as much about gas as oil. The number of rigs drilling for gas there has jumped from about 20 in early 2013 to 60 last month, as the country tries to develop its own resources to support a growing petrochemicals industry and free up oil for export. The first part of Saudi Arabia's "market share" strategy saw it refuse to continue cutting output to prop up high-cost producers elsewhere. As a result, U.S. production has fallen by about 600,000 barrels a day from its recent peak and other high-cost areas are following.The Saudis may not have announced part two of the strategy yet, but it's well underway. But what may be most concerning for oil bulls, especially in a world in which demand refuses to pick up to "balance" the massively oversupplied market, is another Bloomberg report that in what would be the second phase of the kingdom's strategy to defend its market share against rival producers (most visibly U.S. shale), Gulf states are planning to raise output capacity to fill the hole left by the lack of investment in new projects elsewhere. The number of rigs drilling for oil in three Arab countries has more than doubled since 2010. All three saw drilling reach at least 20-year records in 2015 and activity remains close to that peak. An expansion at Saudi Arabia's Shaybah field should add 250,000 barrels a day as early as June, while the Khurais field could contribute another 300,000 barrels by the end of 2017. State-owned Saudi Aramco says this will let it ease pumping from older fields yet maintain a production capacity of more than 12 million barrels per day, 2 million barrels above its current rate. For Kuwait and the U.A.E., the goals are even higher. Kuwait plans to raise production capacity by 5 percent from 3 million barrels a day by the third quarter, and to reach 4 million barrels by 2020. Abu Dhabi means to lift production capacity to 3.5 million barrels a day by 2017 from about 3 million. So in an environment in which not only the Saudis but Kuwait and the UAW are all planning to unleash millions more barrels of oil, the market somehow believes that next Sunday OPEC will agree - and actually comply - with a production freeze? The algos may be stupid enough to believe it, but we hope any carbon-based traders can see the writing on the wall.